Bird, aka JB's Thunderbird, is a 5-year-old red male born August 15, 2010. His sire is Lonesome Cry and his dam is Flying Argyle. 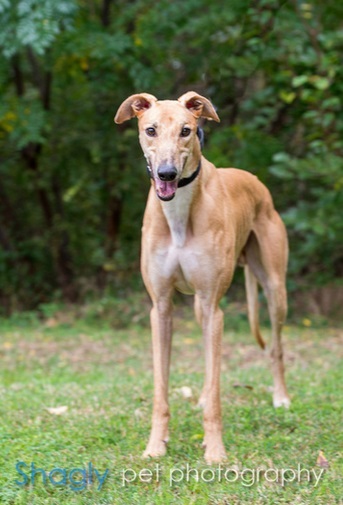 Bird has 94 races on record at Greyhound-data.com in Florida and Texas from April 2012 to June 2014. Bird may have flown around the track, but now he's ready to fly onto your dog bed! Bird has passed an initial cat test, but has not yet lived with them in a foster home. Bird was in a home for a year, but has returned to GALT due to being afraid of small children. I had the pleasure of having this big sweetheart with me for about 4 weeks over the holidays so here is what we know so far since he had never been in a home before mine. Bird is fresh off the track and needs guidance so he understands the rules. We started with baby steps as if he were a puppy in a new home. He crates well and wore a belly band for the first week but didn't have one accident so he is no longer wearing one at this time. After the first couple nights he started sleeping outside his crate in the bedroom with the rest of the family. He sleeps through the night without incident. He loves to help in the kitchen (a little too much, unfortunately) so we're working on his counter surfing issues with a water spray bottle and "no" command. He LOVES feeding time most of all. He still "bolts his food" so he's being fed in a separate room for now to reassure him that no one else is going to take his food away. He's learning to "wait" for his bowl to be placed in the raised feeder before being "released" to eat. This takes every ounce of patience he possesses so there is generally drooling involved while he waits for the "release" command but he's doing very well so far. 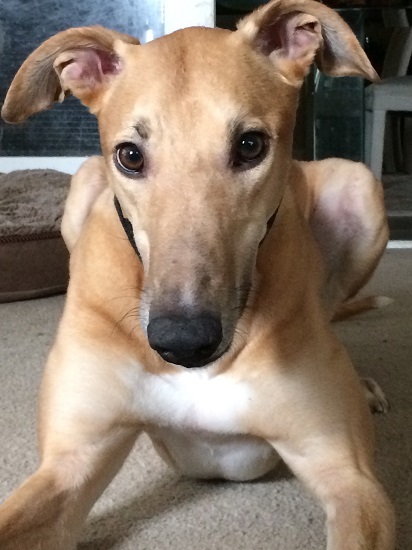 He enjoys having other greyhounds around and has adapted well to a home environment, loves comfy dog beds and toys. He's perfected the head prop and roaching-on-his-back position. He needs someone who can provide consistent training and a regular daily schedule - he's a smart guy and wants to learn. Being highly food motivated is a plus for training. I know he's going to make some family a wonderful companion dog - good luck little buddy and keep up the good work.